One benefit of using WordPress is that you may invite others to collaborate with you on your site, however, collaborators must be part of the UCI community and have a UCInetID and @uci.edu address. By default, as the site owner, you are the Administrator and can assign access rights to collaborators based on their role. 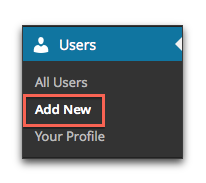 In the Admin Panel, click on Users > Add New. 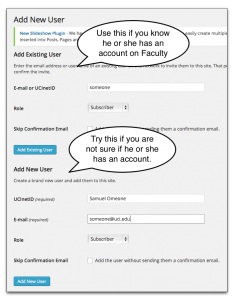 Add Existing User – this is for adding users to your site site who are already using Faculty Websites. Fill in the required fields, providing the UCInetID and/or email and select a role from the dropdown. Remember to click the Add Existing User button at the bottom of the section. 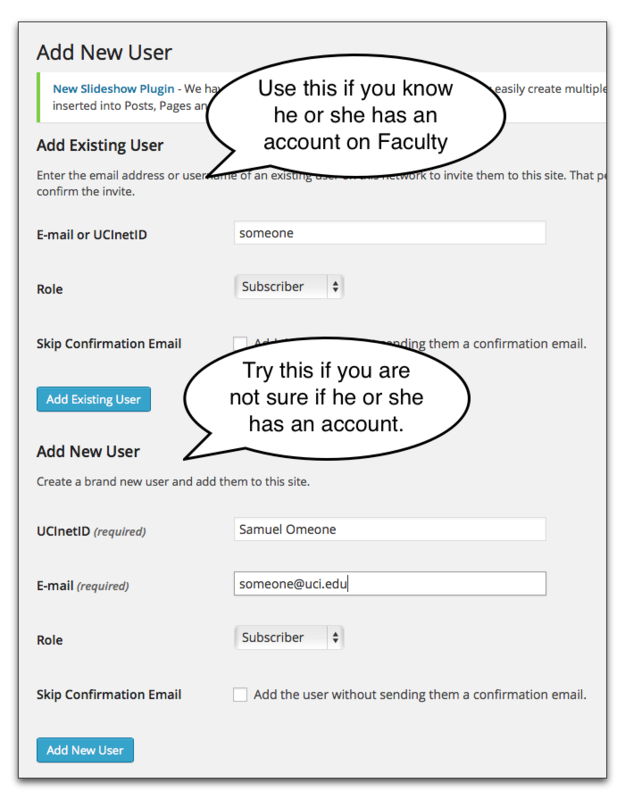 Add New User – this is for adding users who are brand new to Faculty Websites. Remember to click the Add New User button at the bottom of the section. A message at the top of the panel will tell you that your user has been added. An email invitation will be sent to your new user with a link to confirm the invitation. When your invitee clicks the link, he or she will be added to your site using the role you assigned. Your user will also be given links to the site and the option to login. Once your new site user has accepted your invitation, you will see his or her name in your list of users. 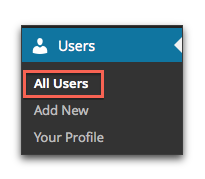 In the Admin area, click on Users > All Users. On the Users page, you can manage or delete your users from your site. If you delete your users, you can assign any posts they may have authored to someone else. Check the box next to the user you want to assign a new role. 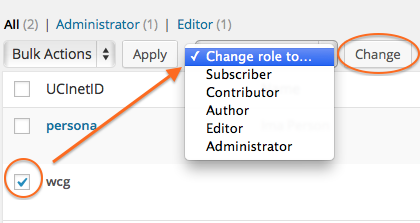 Click the Change role to… drop down menu and select the new role.